Our Summer 2019 semester is 13 weeks long (May 13th - August 11th). We teach all of our leveled classes (i.e. silks 1, trapeze 2, etc.) based on our progressive curriculum, therefore, we close all leveled classes to drop ins on June 10th. Safety and basic technique will be taught in the first few classes; after that, classes become too advanced for new students. We hope you join us for all 13 weeks! All conditioning and aerial yoga classes are open to drop ins all semester long. Gain body awareness, strength and confidence while learning tricks, wraps and dance elements on the silks. Made of a nylon based fabric, silks are an incredibly strong and versatile apparatus. Experience true momentum as you explore the dynamic art of static trapeze. Weave your way around the bar and through the ropes as you learn skills, transitions and dynamic poses. Also known as the aerial hoop, lyra focuses on working around a solid, spinning shape. Learn grace, poses and the dynamics of spinning as you work on sequencing and strength. Focused on fitness, dance and agility, pole explores working yourself around the apparatus, rather than the apparatus wrapping around you. Using your skin as a hold, work on body awareness, sequencing and inversions. Similar theory to silks, rope classes are a bit more dynamic and strength based with a single pole of rope. Pre-requisites: must be able to do a pull up, must be able to invert on your own, must be able to hang by your hands for at least 15 seconds. Take yoga to new heights with aerial yoga. Make traditional yoga poses easier or more challenging as you hold them with the assistance of a silk sling. Aerial yoga is a great into for students wanting to stay on or close to the ground, or want a gentle introduction to aerial. 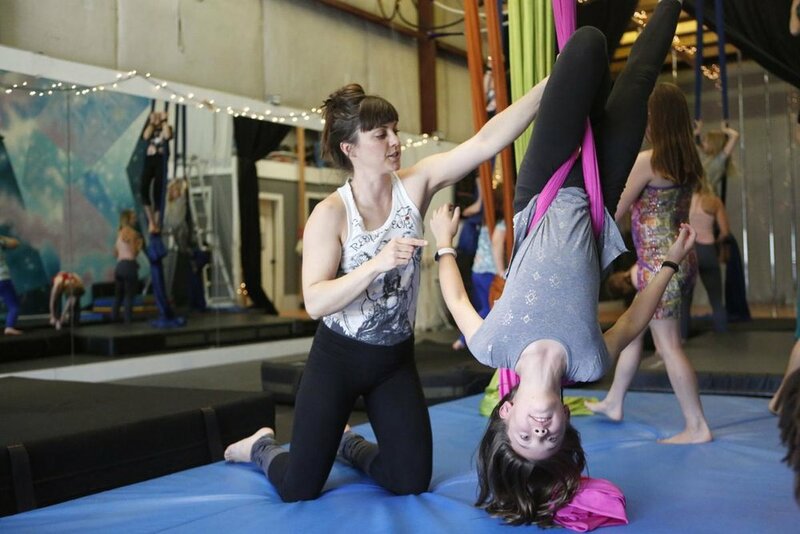 We offer all levels youth classes (ages 7-12) in aerial silks, trapeze, lyra and pole. Youth classes focus on strength, grace and camaraderie between young students. For ages 5-6, little flyers is a 45 minute sampler of all apparatuses, focusing on sensation, body awareness, strength and fun. A perfect aerial introduction for a little acrobat! Interested in a birthday party, bachelorette party or work party at Momentum? We offer all sorts of lessons to accomodate your needs.